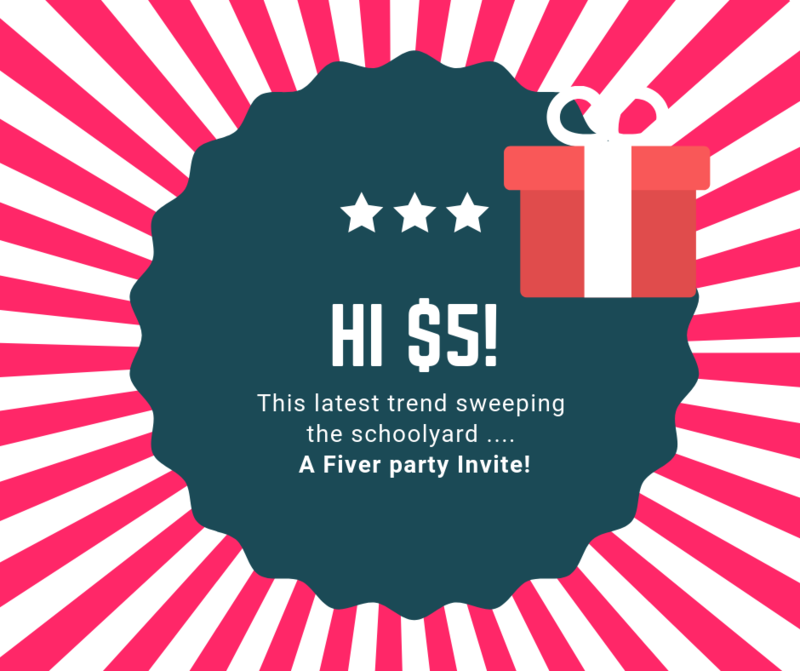 The latest trend sweeping the schoolyard – The Fiver Party invitation! This latest trend ‘Fiver Party Invitation’ sweeping the schoolyard could be a solution for a birthday party that won’t break the bank! Kids love receiving invitations to birthday parties but, for some parents, it can be an expensive exercise to purchase gifts for your children’s friends every few weeks. And for the parents of the birthday child, you are often left with unnecessary plastic toys that add to the clutter in the home, not to mention the clutter on the planet. Enter: the Fiver party. Instead of bringing a gift, each party attendee brings a five dollar note tucked into a card. The birthday child can then use the money to buy something they really want. Presents are not required but $5 contributions to Elsa’s scooter fund will be greatly appreciated! As the Fiver party concept becomes more commonplace, the wording can perhaps be replaced by a simple declaration like, ‘This is a fiver party!’, but in the meantime it is best to tread carefully so as not to offend anyone. Why have a Fiver party? The Fiver party concept allows children to choose carefully what they spend their money on. It encourages learning around saving and making change, and it can also spur conversations around waste and looking after the planet. The importance of a card is driven home. Often, children will ignore the card attached to a present as they hungrily rip into the wrapping. At a Fiver party, the attendee can write a heartfelt message or draw a picture that will actually be seen – before the cash is snatched and pocketed, that is! A special and bright kids mug with some sweets in it (if you like) won’t cost much and will often be well-used in the home when kids have hot chocolate or Milo. Books are always appreciated by parents (and by kids later, once the excitement of the party has died down), although they are not always cheap. Buy them on sale and keep for when birthdays come up. The Scholastic Lucky Book Club brochure usually has a few $2 books on offer. Art supplies can be found at reasonable prices and can be combined to make an inspiring gift. Items like pipe cleaners and sticky note shapes make for interesting, creative projects. Cookie mix in a jar. Simply layer all the dry ingredients you need for a batch of cookies into a large jar and label it with instructions. The birthday child can then add the wet ingredients and make their own treats. You can get your child to help design the label and measure the ingredients for an extra learning opportunity. Don’t go overboard on the expensive gifts, even if you can afford it. It can make other parents and kids feel bad. You might even upstage the birthday child’s parents. If more than one of your children is invited to a party, bring a gift from each child if you can, even if each gift is small. Avoid noisy toys and items that will take up a lot of space, if you want to remain friends with the parents of the child you’re buying for, that is!